In addition to the product-wide improvements in v5.1, the release introduces an exciting new feature for TWC customers – single folder filing! As TWC followers are aware, filing to a single folder is a core feature of Michael Linenberger’s methodology. 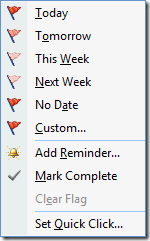 Use ClearContext filing buttons to assign categories and file to your processed mail folder. Download the TWC version here. Single folder filing is enabled by default. To continue to file to individual project folders, go to ClearContext > Options and uncheck "File all messages to root folder"
By default, the MYN Powered version files all messages /Inbox/Processed Mail. Change the folder you file to in Root Folder for Filing and Projects in ClearContext > Options. Note that if you previously designated a different root folder here (i.e. /Inbox) single folder filing will file to that folder instead of Processed Mail. If you are using the default TWC toolbar, filing buttons will appear after the upgrade. If you customized the toolbar, you may need to add these buttons via ClearContext > Options > UI/Toolbar. Michael has posted a wealth of information about v5 on his website. Start here. Posted by brad at 6:14 pm on July 1st, 2010. In the Manage phase of the Daily Workflow, we explicitly advise that you act on each message quickly or convert it to a task or appointment and file away the original message. The idea is to process the message when you first look at it so that you can get it off your mind and out of your Inbox and you don’t waste mental cycles dealing with it. There is one expert-use case where this doesn’t make sense. When you encounter a message that you know you want to respond to today, but you either need to think on it a bit or you don’t have time to answer right now, it doesn’t necessarily make sense to convert that message to a task. Flag this message via a right click so that you know that you looked at it and you’re waiting to process. Then, at the end of the day, go through each flagged Inbox message to answer and file. "If the reason you are not responding is there is some other task-like action needed first to fulfill the request, then better is to convert the e-mail to a task, and plan on working the task, and then reply immediately saying ‘I need to do xyz before I can get back to you on this; I will get back to you as soon as possible’ or some such reply." See the manage tag on our weblog for more tips on optimizing your implementation of the IMS Daily Workflow. 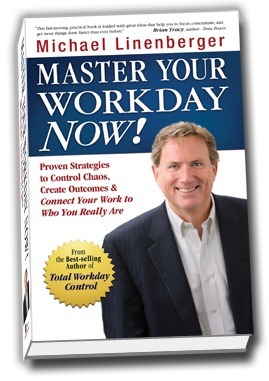 Michael Linenberger, author of best-selling Microsoft Outlook book Total Workday Control and ClearContext partner, publishes a newsletter chock full of Outlook tips and ways to leverage the TWC system. In the latest he talks about IMS v4 and how it works with TWC. If interested, you can sign up to receive the newsletter at the link at the bottom of the page. Posted by brad at 10:26 am on December 1st, 2007. Categories: outlook, productivity, tips, twc.